The Independent Critic - The Independent Critic Chats With Gil Birmingham, Co-Star of "Hell or High Water"
The Independent Critic Chats With Gil Birmingham, "Hell or High Water"
Have you ever had a film just sneak up on you? A film where you didn't really expect all that much, but you found yourself completely blown away by film's end and ready to watch it all over again? "Hell or High Water" was that kind of film for me. In fact, we're only in July but I'm already calling it. "Hell or High Water" is one of the best films of 2016. The film stars Chris Pine and Ben Foster as two brothers, one a divorced dad who has been down on his luck for a bit too long and the other an almost hardened criminal who has just been out of prison for a year. Desperate to save their family's West Texas farm from foreclosure, the brothers plan a heist. 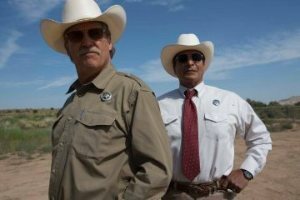 Two Texas Rangers, played by Academy Award winner Jeff Bridges and Gil Birmingham, are out to stop them. "Hell or High Water", a CBS Films Release, had its Indianapolis premiere on July 22nd as part of Indy Film Fest at the Indianapolis Museum of Art ahead of the film's limited release on August 12th and nationwide release on August 19th. Indy Film Fest and CBS Films brought in Gil Birmingham, an American actor of Comanche ancestry and easily one of the most talented and popular Native American actors working today, to participate in a post-screening Q&A and meet with local press. Gil Birmingham has been working steadily since his "acting" debut, an appearance in the video for Diana Ross's "Muscles." From there, Birmingham has appeared as the wheelchair using Billy Black in the "Twilight" films along with such films as "The Lone Ranger," "Crooked Arrow" and voiceover work in "Rango." These days, you can also see Birmingham in the second season of "Unbreakable Kimmy Schmidt" and recent episodes of "House of Cards." The Independent Critic had originally been slotted 10 minutes with Birmingham, a fairly standard interview block in this kind of scenario, but a funny thing happened on the way to that 10 minutes. 10 minutes became 20. 20 minutes became 30. 30 minutes became 40. As we sat in one of the IMA's classrooms right before the festival's screening of "Hell or High Water," the second time I have seen the film, what had been planned as a quick film promo suddenly became much more as Birmingham talked about his ancestry, the importance of respecting that ancestry in film, his participation in "Hell or High Water" and a whole lot more. First off, I love your film. I did get the chance to see it before tonight's screening. I think it may very well be my favorite film of the year so far. We've really been getting a lot of that ever since it came out of Cannes. It just nails it. You know? What you want from that type of a film. You're wonderful in it. Jeff Bridges is wonderful in it. I think Chris Pine may give a career best performance here. Honestly, he's amazing. I'm not saying he's been bad before, but this is special. You've never gotten to see him in that light before. He's been trying to stretch himself, but he's just really off the hook here. The cohesiveness of the cast is just perfect. So, well, I guess it's obvious I'm a fan of the film. 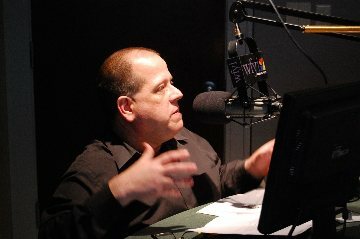 One of the things I kind of wondered about as I was going over your filmography and your television work, which are very comprehensive as you've been around for a long time, but as I look over your projects I can't help but notice that you've largely avoided playing Native American stereotypes. You are an actor. You are Native American and you've played a number of Native American roles, but not in the ways that Hollywood can sometimes stereotype. The characters you play are, for the most part, full and well developed characters. I've done quite a few period pieces Like Into the West. Some of them are what I'd consider the best work I've done. In terms of presenting and portraying the Native culture and the historical accounting in a more realistic way, We're talking about a hundred years of portraying them as savages and stereotypes that were never really true to begin with. So, I've committed myself to just doing roles where I can bring a human being into it and not just this idea that has been perpetuated for so long. So, that's a conscious decision for you? You really look for those roles? I do. I mean, we get choices that cross the table and I'll look at readings and I'll go "No, this isn't really something I could do in a real way and honorably." I think that's the key... to bring honor to the Native culture and our ancestors. So, yeah. I've turned down a number of projects. I wondered about that. Of the films of yours that I've seen, I'll openly admit not all of them, there's that consistency. I don't see a caricature. Even in this film. I got a little nervous when the banter between you and Marcus (Jeff Bridges) started. I was sitting there thinking to myself "Please don't tell me they're going to go there." But, it doesn't. No. Right. The context that it's written in and what Jeff and I had worked with was the chemistry of two people who had become practically family. Family will tease each other and sometimes to extreme and even cruel ways. But, the love was there and that was real important for me. The scene where you're in the motel scene I thought was such a neat, intimate scene of two people who are family. There is that bantering back and forth, but watching your facial expressions and watching his you could just feel it...it was affectionate and you both just played that scene really well. Jeff had such a brilliant move. It was just like a split second after he's done the shooting and after all the commotion of tracking these guys down and you could just feel this brief moment where he was just now getting in touch with the emotion around his friend and roles being reversed. (Editor's Note: At this point, Gil and Richard briefly discussed a pivotal scene in the film. Out of respect for the filmmaker, this discussion has been mildly edited to eliminate potential spoilers). I was not happy with that scene. I sure wasn't. That was a great scene, but it was a hard scene because by then we've bonded with all the characters. I think that's funny in a way, because you really do kind of have that West Texan stoicism going on. It's really not an overtly emotional film, but it is an emotional film and we really do get invested in these characters. Even with Chris and Ben's characters, there's no caricatures there. They're fully developed. They're human. They're making choices, not great ones, but they're making choices for reasons that are explained whether you accept them or not. I think it's so representative of what people are really living, especially in hard economic times and even now when many haven't recovered from the recession of 2008 and feeling somewhat powerless with seeing corporate America doing great but they're still struggling and being left out. The moral question of this film is "What does a man do when he's trying to survive with his family, but the powers that be are out of his control?" Man, you're making me want to stay again and watch it tonight. I may have to. Okay, so other than respecting the Native culture what makes you say yes to a film or television project? I'm also a big fan of Unbreakable Kimmy Schmidt. That's funny, because I had been doing these movies and I hadn't really dabbled into comedy. I have such a great time on sets. I think maybe my closest was Rango, an animated film. I kind of thought "I want to do some comedy." I wanted to have that experience. I think it was maybe a couple months later that I got the call for Kimmy Schmidt. I go out...there's Tina Fey...totally over the top. I thought to myself "Am I up for this?" The writing there a great example of not playing stereotypes. I'm playing a Native American, but there's a woman playing our daughter who's got blonde hair. As usual, Tina does brilliant work and I was really happy to be part of that. So, I guess to answer your question - it always starts with the writing. I've been blessed enough that I can have choice. I don't need to take everything that comes down the line. It's always the writing. That makes me wonder. I know a little bit about your early career. You started out in an entirely different field. Was it industrial engineering? I know it was some type of engineering. Oh yeah. No wonder I couldn't remember it. It's hard to even say. Way beyond me. I don't think I would pass the first class. That's kind of what I did as a survival thing. I got involved in that industry and started thinking "This isn't really how I feel." We're perpetuating fossil fuels. This isn't having respect for the Earth. I was very young and kind of got guided along by my mother into a career where I could at least sustain myself. Then you did this video? Diana Ross's "Muscles." Oh yeah, that's when all hell broke loose. I'm not sure about the culture in that one. It was such a random thing, but when I look at it it's what got me involved in acting. I mean, c'mon. It's Diana Ross. That's what I say! It was never something I anticipated or thought about. I played music from the time I was a kid. My fantasy was to be a rock star. Really, more than anything, music is still near and dear to my heart. I couldn't do the engineering anymore. I wanted to explore this aesthetic world of body-building. Then, I got tapped by a producer who came to the gym and asked me to be part of this video for Diana Ross. I thought "Diana Ross, that sounds fun! What? I'm mostly naked?" How did you explain that to mom? Oh, I've got stories about my mom. How did she handle it when you steered yourself away from Petrochemical engineering? You know? That sure thing to move over to the not so sure thing of acting? Well, there's a big gap there. I left home at a very young age. I didn't really need my mother's approval. We've had some reconciliation. Something funny about my mom...she's a very religious person. I had done a movie, the first Twilight movie, and just prior to that had done a movie with Joe Pesci and Helen Mirren, Love Ranch. She asked me "So, what have you been working on?" I said "I've got this love story. It's called Twilight." She was like "What's it about?" "It's a love story...vampires, werewolves." She said "I wouldn't be interested in seeing that. What's your other movie?" "It's a movie about a couple who started the first legal brothel back in Nevada." She goes "Now, that sounds interesting." I have to ask you. Obviously, I'm a film writer in a wheelchair. How was it playing a character in a wheelchair? You played, and I think most people will know this, Billy Black in the Twilight films. I did. You know, not to make light of it, but you know there are talented people who are in wheelchairs who maybe should have been considered. Of course, you've got to make decisions of that sort as well. The benefit for me was that I never had to find a seat for myself on the set. I mean, c'mon, we'd be out there for 14-hour days. I use that line all the time...gotta' use the humor, man. You've had a lot of popular projects. Did doing that film help you or how did it impact your career? I'm trying to remember, but I assume that's been your biggest film in terms of box-office? It's show business. For an actor to have that kind of exposure and a fan base, because the fans are the ones who really keep us alive, was pretty phenomenal. Being a part of pop culture and seeing people camp out for five days was just wild. Gil Birmingham stars alongside Jeff Bridges in the CBS Films release "Hell or High Water"
I was talking to Katie, your marketing rep here, and she even talked about noticing that you get recognized. You know, I'm sure I do. Are you just so used to it now? No, no. It's really just the opposite. I really don't see myself any different now. There's so many different projects that I've done and different demographics that I've locked into. I did a lacrosse movie called Crooked Arrows and there's a passionate following of lacrosse players and they will watch that movie every day. I just talked to this guy today and he said he'd been at home watching Rango with his kids every day. Then, there's Kimmy Schmidt and House of Cards. When I see fans approach me, I have fun trying to figure it out and asking "Oh, I wonder which project it is?" And they're so diverse. I mean, even the ones you just named. They're so incredibly different. Once you decided to really go into the acting and pursue it, how did that all go for you? I mean, obviously, you started out really getting recognized for your body. There was a point where you started doing acting. Was there a point where you found yourself thinking "Okay, I'm actually pretty good at this?" Good question. I don't know if you ever get to a place where you say "Yeah, I've accomplished the craft." There's always, for a life time, much like music, an ever-evolving process and you get to work with some of the masters and the greats and you go "I want to be able to do that." The Native culture is big on being humble and just being grateful. It's a gift to me that Creator has put me in a position that I can portray these characters and I just want to honor that as best I can. That kind of leads me to a question I was hoping I'd get the chance to ask. I looked at your website. I noticed that you support some organizations and that serving others seems very important to you. For example, on your website you specifically mention organizations such as Autism Speaks, Stomp Out Bullying and the Dreamcatcher Charitable Foundation. So, obviously, you do believe in doing what you can to give back to the community. Which I don't always hear when I do interviews. Some people, oh yeah, they're very into it. Other times, you kind of get this sense of "Nope, I'm a star now." You know, I actually support charities and I don't really want to go around like I'm bragging about it or anything. I do community work, but it means more to me if I'm just doing it and not really talking about it. The spirit of it is truer for me. There's a lot of charities that do great work and I've been supportive of several of them. I certainly don't want you to feel like you're bragging or anything uncomfortable. The Independent Critic is a website that promotes a lot of social justice issues and community involvement. So, I always get a bit excited when I'm able to interview someone who has that spirit of serving others. Can you talk a little bit about the shooting of this film, Hell or High Water? I know it's kind of a cliche' question, but how was the shoot for you? It was hot. We were pretty much in the Summer. I remember the shoot-out scene was 104 degrees. We were out in some remote area in the mountains so that wasn't any shade or anything. It got very dusty...very dirty. For the most part, just some spectacular landscape that ended up almost as another character in the movie. They created an environment to be there with that. Basically, I shot a film with just Jeff and I because I don't have any crossover with the two brothers until the shoot-out. I don't have any scenes with them. Every day, I was just pinching myself just thinking "I can't believe I'm doing a movie with just me and Jeff." Jeff is a musician. So, from the beginning that was our real connection. He had me bring my guitar to set every single day. We'd have the screenings and the dailies at the end of the day, but after that it was party time! I'm sitting there jamming with The Dude.